CHARACTERISTICS OF SPORTS MATS & THEIR TESTING FOR THE SAFETY & PERFORMANCE REQUIREMENTS OF THE CURRENT EUROPEAN (BS EN 12503) AND BRITISH (BS 1892-4) STANDARDS WITH PARTICULAR REFERENCE TO JUDO AND COMBAT SPORTS. Take a firm and unyielding surface of concrete. Place a sports mat on top and drop an iron ball onto the mat from a height of a metre or so. What happens? As the iron ball hits the mat, there is progressive indentation. It then bounces up clear of the mat and comes to rest after a few decreasing repetitions. What measurable effects are taking place? The iron ball is experiencing three properties of a sports mat which are of crucial importance with regard to the mat's functions both in providing a performing surface and in protecting from injury as a result of falling or being thrown. When the ball reaches the surface of the mat and starts its indentation, it experiences a rapid deceleration due to the increasing resistance of the mat as compression occurs. The deceleration increases to a maximum and than falls to zero as the ball comes momentarily to rest. The highest level of deceleration experienced by the ball is defined as the PEAK DECELERATION and is measured in terms of multiples of g (the gravity force) - otherwise referred to as peak g. (This effect is the same as we experience when a lift halts rapidly after descent. Temporarily we experience an increase in g but this is usually only a small fraction above normal gravity of 1g). The ball while experiencing deceleration, is progressively indenting the mat. The point of maximum indentation measured from the original surface of the mat is defined as the 'DEFLECTION' and is measured in millimetres or as a percentage of the mat thickness. After the ball has come to rest, it is pushed upwards and clear of the mat surface due to energy stored under the compressed area. The height or velocity of the rebound is a measure of the ability of the mat to return this energy while the ball and mat are still in contact. This property is known as 'RESILIENCE' and relates to the amount of energy returned. In summary therefore, the ball indents the mat for a depth known as the DEFLECTION and in so doing, experiences a deceleration measured in multiples of the gravity force – g. Some of the energy from the mat's compression is released quickly enough to propel the ball back upwards, the extent of this being a measure of the mat's RESILIENCE. These are the properties revealed by an impacter test. These tests are conducted with a mat of defined specification and minimum size laid on a concrete base. 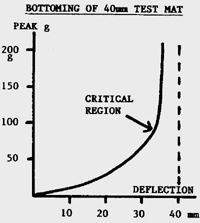 The three characteristics of PEAK DECELERATION, DEFLECTION and RESILIENCE can be measured by dropping an impacting apparatus of defined shape and weight containing an accelerometer. This is connected to a remote electronic apparatus which is able to record PEAK g directly. From the same impact, the apparatus is able to record other data from which DEFLECTION in millimetres and RESILIENCE as a percentage of energy returned, can be calculated. The impacting apparatus consists of a central steel body of variable weight underneath which is fixed an impacting plate which is easily removable in order that plates of different diameter and curvature can be used according to the requirements of the test. Above the central body, there is a vertical stem which provides a housing for an accelerometer and which is connected by light flexible wires to a data capture unit which digitally records information for analysis. This recording apparatus is situated some distance from the test mat. The accelerometer is a precision instrument capable of measuring large changes of g which take place in very short time intervals. The assembled impacting apparatus is held suspended over the test piece by an electromagnet which enables a smooth and even drop when current through the coil is switched off. There is no guiding mechanism and the drop height is adjustable. as if the impact had been perfectly vertical. In the European Standard, each mat is tested by a series of impacts in defined positions and mean values obtained for the various criteria. In the case of judo mats, the impacting weight is 8kg and the indenting plate diameters are 43mm to simulate a sharp point of the body e.g. heel, a 78mm to simulate a shoulder and a 116mm to simulate a flat part of the body. In addition to the required diameters, each curve has a defined radius of 500mm. The 78mm indenter is used only to compare consistency of one test point in the mat with another. The 43mm and 116mm indenters dropped from both 200mm and 600mm are the defined 4 tests for peak g, deflection and resilience. This produces 12 limiting values which are defined in the European Standard for judo mats. In the British Standard which applies for all combat sports excluding judo, the testing apparatus is similar but the approach for peak deceleration is via a 'severity index'. This is calculated as the height required to produce a peak deceleration of 200 g using a 170kg weight with a 500mm diameter indenter. As a test method therefore, it is quite distinct from the European testing method. The approach for measuring deflection is somewhat complicated but again uses an impact from a falling weight but this time against a defined foot piece. Resilience is not measured in the British Standard. In the European Standard, this is measured by an aluminium slider of defined mass, size and shape which is mounted on the end of a pendulum. This contacts the mat base for a given distance and the frictional energy absorbed is measured. This is computed against the total mass of the mat and therefore only a whole mat can be used for the test. In the British Standard, this is measured as defined by BS 7044–2.2 (1990). This measures 'mean slip resistance' and is also computed against the mass of the mat. In the European Standard, a weighted foot of defined mass, size and shape is rotated in contact with the top surface of the mat. A gradually increasing torque(twisting movement) is applied until there is initial movement. This value of the torque is recorded. In the British Standard, this is measured also as defined by BS 7044–2.2 (1990). This is only measured in the European Standard. Static stiffness is a special type of deflection measurement but also takes account of the deflection which is at some distance from a static (50kg) load. 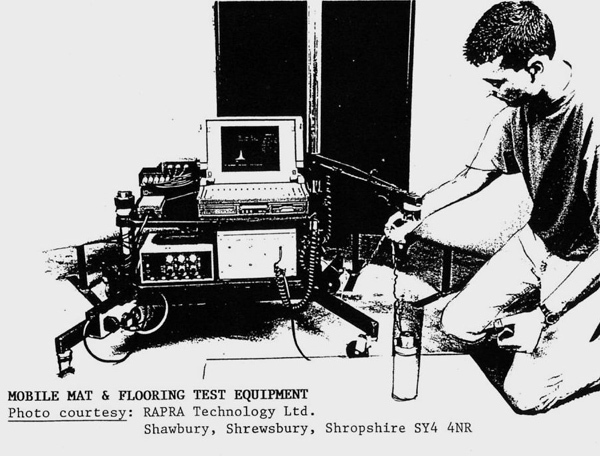 This test is necessary to account for the effects of a sprung floor which in itself could allow for considerable downward movement on impact but not resulting entirely from deformation in the mat itself. In the European Standard, dimensions must be a multiple of 1 metre with a tolerance of only ± 5mm. Thickness must be 40 or 50mm with a tolerance of ± 3%. In the British Standard, the mat width can be 1000mm (1m) or 1200mm (approx. 4ft). If the mat is 1000mm wide, the length must be a multiple of 500mm. Tolerances on dimensions are rather more extensive than for the European Standard. There are diagonal measurements to consider and no negative values. Thickness is not defined in the Standard but if a manufacturer states a thickness, there is only a plus tolerance of up to 2mm. (It is perhaps worth noting that it is highly unlikely that any mat which is less than the standard 40mm could stand any chance of conforming to the peak g limitation). This was discussed at some length for inclusion in the European Standard. Although there are acceptable ageing tests, no agreement was reached and this may well be a feature when the Standard is eventually revised. Ageing was not considered for the British Standard. Both Standards however test for 'compression fatigue' since the impacter tests are repeated several times on the same spot. It is worth mentioning here that ageing could be a very significant factor as far as the end user is concerned. 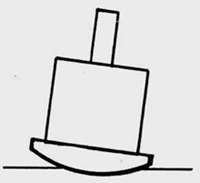 For example, it is possible for an unscrupulous foam manufacturer to infuse a soft foam with chemical hardener in order to avoid excessive deflection or peak g. Unfortunately, the method is somewhat empirical and if the foam keeps hardening, one can end up with a mat which loses much of its resilience and becomes more like a piece of concrete! Caveat Emptor (Buyer Beware). One cannot tell such things from a small sample or the initial condition of the mat, so at the moment one will have to trust the supplier ! This was also discussed for inclusion in the European Standard. It was only supported by the UK and is unlikely to be seriously re-considered in the foreseeable future. The British version of the European Standard refers to flame retardancy in an informative annexe but does not in itself specify detailed tests. The British Standard BS 1892-4 states that fire resistance for combat mats shall comply with BS 1892-3 which is a somewhat diluted version of the now superseded BS 1892 Section 2.10 and which was discontinued in 2001. The situation is somewhat complicated and involves, amongst other things, the type of building and storage conditions. Fire resistance is not related to the combat performance of the mat but may be considered in more detail at a later date.